QED Performance Digital Optical Audio Cable is a reference all-purpose optical digital interconnect, ideal for use between a CD transport and DAC or in high quality audio visual applications that include DVD or Laser Disc players. It is compatible with TOSLINK™ optical input and output sockets. QED's no-compromise design and build process demands a medical grade fibre optic core polished at both ends for maximum light signal transfer. This is shrouded with a durable, flexible metallic graphite-grey PVC jacket which protects the fibre optic core from damage. 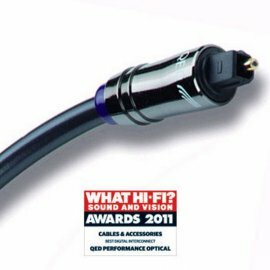 QED's Performance Optical Cable utilises precision moulded plugs with spring-loaded tips and zinc-plated barrels. These features improve optical alignment and optimise the accurate transfer of digital pulses. The result is higher resolution, sharper focus and amazing music. QED Performance Optical TOSLINK Cable.